Fallout was the first role-playing game I ever played, and in retrospect, it spoiled me forever! Before Fallout, I had only played adventure games, imagining that RPGs wouldn't be my cup of tea due to the usually large amount of combat and lack of challenging puzzles. But I was ever so wrong. Fallout is every bit as good as an adventure game, with intriguing quests and a clever dialogue system taking the place of traditional adventure puzzles. And it also features a high degree of replayability. While writing this review, I am playing it for the 10th time! 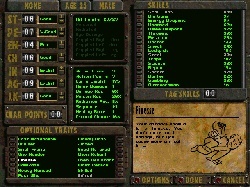 Fallout was arguably the game that played a major part in resurrecting the PC RPG genre, which was in a big slump at the time of Fallout's release in the latter part of 1997. Fallout changed the way people thought about RPGs. It brought us out of the realm of dwarves and elves, and into a brave new world - a world devastated by a nuclear holocaust that left only a handful of survivors. The brilliance and flexibility of Fallout's character generation system is second to none. The game's role-playing framework was originally supposed to be Steve Jackson's GURPS, but the deal with Interplay somehow fell through and an entirely new system was born: SPECIAL (an acronym for your character's main statistics: Strength, Perception, Endurance, Charisma, Intelligence, Agility, and Luck). You start out with 5 points in each stat, and have 5 more points to allocate as you wish. But the real beauty of Fallout's system is that, unlike with most other RPGs, you can subtract points from any stat, and allocate them elsewhere. Want to play a dumb, heavy-handed brute? Then subtract points from Intelligence (IN) and add them to Strength (ST). How about a 'diplomat' type character that can talk his/her way out of almost anything? Then bump up your IN and Charisma (CH) at the expense of ST and Endurance (EN). And so on. You can play a male or female character, and there is absolutely no difference to the way the game plays out. You'll just get different in-game animations. To add even more flavour to the mix, you have the choice of up to two optional character traits. These traits always exhibit both a good side and a bad side. For instance, my favourite, Finesse, adds 10% to your chances of causing a critical hit (which doles out several times more damage than usual), but you do less damage generally as a result. There are over a dozen of these to choose from, with themes like: Heavy Handed (the exact opposite of Finesse), Night Person (your IN and Perception (PE) increase at night, but are lessened during the day), etc. And finally, you can 'tag' 3 skills from a list of almost 20. Skills are expressed as percentages, and when you tag a skill, it boosts the starting percentage dramatically. Also, each skill point you subsequently put into a tagged skill (you get skill points to spend each time your character gains a new level) gives you a 2% increase to the skill, whereas you normally only get a 1% increase. Typical skills are: Small Guns, Energy Weapons, Doctor, Sneak, Steal, Speech, and Barter. But that's not all! During the course of the game, you get even more character development opportunities in the form of 'perks'. Every time your character attains a level that is divisible by 3, you get to choose a new perk. Typical perks are: Sharpshooter (boosts your PE by 2 for the purposes of determining range modifiers in combat), Thief (gives a 10% bonus to your Sneak, Lockpick, Steal, and Traps skills), and Quick Pockets (you can access your inventory faster during combat). There are dozens of these perks to choose from, and they, along with the aforementioned traits and skills, allow for a great degree of determination in building characters that you really care about, which to me is the very essence of role-playing on the computer! Now that you've created your character, it's time to head into the wasteland (by the way, Interplay acknowledge that Fallout is the 'spiritual' successor to Wasteland, their original post-apocalyptic RPG), which brings us around to the genteel subject of combat. The combat in Fallout is turn-based, and very strategic. Each creature involved in a combat situation has a certain number of 'action points' (AP) to spend per turn (directly related to their Agility (AG)), and these AP can be spent on things like: using a weapon, accessing inventory, and movement on an imaginary hexagonal grid. The majority of your time will be spent firing exotic ranged weapons at your enemies, unless you go the way of the hand-to-hand specialist, which is also possible. Fallout pioneered (as far as I know) the concept of the 'targeted' shot, whereby spending an extra AP on a shot or melee strike gives you the opportunity to go for a specific part of the critter's body, like the eyes, or the left leg. A targeted shot has less chance of hitting the target, but if it does hit, causes a lot more damage than usual. Brilliant! Fallout can be a bit violent in this respect, and carries a 'Mature (17+)' rating on the box. You will see critters (including yourself) cut in half by a big gun, melted into a pile of goo by an energy weapon, and fried to a crisp by a flamethrower. Neat. There are other mature themes in the game, especially concerning the use of drugs, so you should be aware that this game is definitely not for kids. However, it's probably not much worse violence-wise than other games in the genre. Just that the effects of zapping creatures with modern weapons rather than spells makes it appear to be more violent in some people's eyes. Anyway, the gist of all this is that the pure turn-based combat where you can plan things carefully, without having to hit the space bar every few seconds to pause the game, makes for a refreshing and relaxing change from most of the other RPGs of late. Do I go for a targeted shot to the eyes to take out the biggest threat, or strafe the area with my sub-machine gun to try for two guys at once? And it all unfolds like a chess game, albeit at a slightly more frenetic pace. Like all games at the top of the RPG pile, Fallout presents a very strong story line, and a fantastic dialogue system. 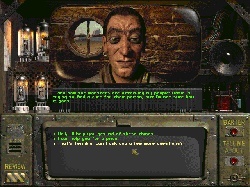 In fact, the dialogue system in Fallout is even superior to that found in Planescape: Torment, and that's saying a lot! Dialogue choices are limited by your IN and CH, and there's also an element of luck involved in that you may only get important plot-steering choices as the result of a successful 'dice roll'. Some of the more important people you talk to are presented as 'talking heads', and it's a lot of fun to drop a clanger and watch them frown at you, or to see their face light up when you tell them a good piece of news. All the dialogue is subtitled, so you'll never miss out on anything important that a character says. During the course of the game, up to a half dozen of these NPCs that you encounter are willing to join your party (number limited by your CH). 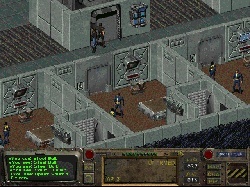 Fallout is presented in a 640x480x256 colour isometric 3rd person viewpoint format. Not something that would ever set the world on fire, but it does the job very well nonetheless. The background music is eerily atmospheric, and a few of the locations boast very catchy tunes (especially The Hub). The opening cinematic features a famous tune from the 50's by the Inkspots, "Maybe". In fact, the central theme of Fallout is this 'retro' 50's style design, where all the electronic gadgets consist of vacuum tubes, as if the more modern transistorised version of things was wiped out by the nuclear holocaust, and a resurrected technology based on the old stand-bys has emerged. It's quite effective and poignant, especially if you're an old codger like me that grew up in the late 60's with the threat of nuclear war as a very real and overshadowing menace that pervaded our thoughts constantly. The manual is also done in the same style, with 50's style cartoons throughout. And if you're going to play Fallout, do yourself a big favour and read the manual before tucking into the game. It's extremely informative and entertaining at the same time. This is the place where I want to talk about the very few flawed aspects of Fallout. For one thing, some have complained that the game is a bit on the short side. This is especially true if you happen to stumble upon the 'correct' path through the game, as I did on my first attempt, finishing with a level 9 character (the average would be around level 18). However, if you take the time to complete most of the available side quests, it makes for a much longer and satisfying passage through the game. Another common complaint was about the 150 day limit to find a replacement water chip, and what used to be a 500 day limit to complete the entire game. The latter restriction is easily removed by applying the version 1.1 patch, which also fixes quite a few bugs, and then you can take all the time you want to appreciate the impressive, almost hidden depth of Fallout. As for the 150 day limit to find the water chip... hey, what's wrong with a little real world urgency imposed on us from time to time, just to make things more exciting? Fallout works fine in Windows XP, and if you select the 'humongous' installation option, it puts the whole CD on your hard disk so that all the areas load instantaneously. There are 10 save game slots, and you should make good use of these. For starters, saving before every important conversation is vital. If you make a big mistake while talking to an NPC, you might miss out on obtaining a quest, or the character may even refuse to speak to you again. Perhaps the strongest aspect of Fallout is that it is ideal for RPG newbies (like I was), yet at the same time provides a depth of role-playing that veterans can really get stuck into. It also has the best replay value of any game I've experienced to date. Start off with IN of 3, and your only dialogue choices consist of variations on a primal grunt. You will hardly be able to get any quests, so you'll just have to blunder through anyway you can manage, but you'll still be able to complete the game. On the opposite end of the spectrum, a character with IN 10 may be able to complete the game without killing a single soul. Fallout also allows you to play an inherently evil character, something that few RPGs up to that time had even accounted for. Another addition to the PC role-playing experience that Fallout gave us was the after-game summary. Depending on how you dealt with situations at various locations in your travels, the people at these locations were affected in different ways. Some villages or groups prospered, others declined or were even annihilated, all depending on your actions. It gives you a feeling that what you did during the game really mattered. The fact that Fallout was my first RPG probably colours my feelings for it somewhat, but this should not belie the fact that it is one of the most influential and well produced RPGs ever to grace the shelves at your local game store. You just know that the Interplay team captured the spirit of a post-apocalyptic world perfectly when the best NPC in the game is ... a dog! See the metzomagic.com Fallout walkthrough.